The cry went out “Thar she blows!”. Whales had been sighted! OK, to be honest the cry was said somewhat sheepishly by the ship’s naturalist, but it did feel like something that needed to be said. Instead of breaking out the harpoons and longboats, we whipped out our cell phones, SLRs and binoculars. Monterey has had a long history with whaling, but now whales are hunted to shoot pictures of instead of harpoons at. 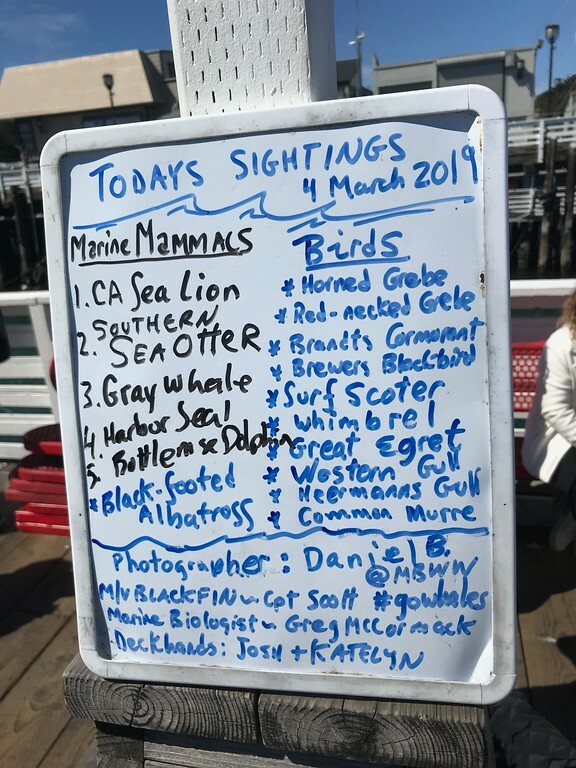 I was on a half day whale watching tour with the Monterey Bay Whale Watch which is one of a few operations that do whale watching from Old Fisherman’s Wharf in Monterey. When I was a kid in area, the only whale watching boats doubled as deep sea fishing boats in the early morning then got hosed off and reused as sightseeing boats in the afternoon. Some of these are still in Monterey but there are also newer boats like the Black Fin which is a double hull catamaran. 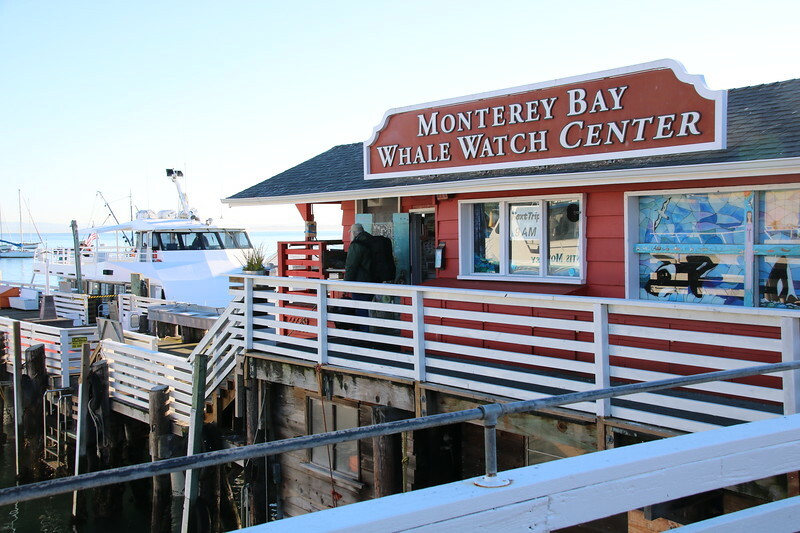 Owner Nancy Black is a marine biologist who started Monterey Bay Whale Watch 20 years ago. We received our safety talk on the dock and then as we boarded the boat the ship’s naturist Greg McCormick asked people where they were from and we had a number of countries represented on our morning cruise. We had passengers from Finland, France, Germany, Malaysia, the United Kingdom, Scotland and even exotic places like Texas. Greg introduced himself as we started the 45 minute of so sail out to where we expected to find the whales. 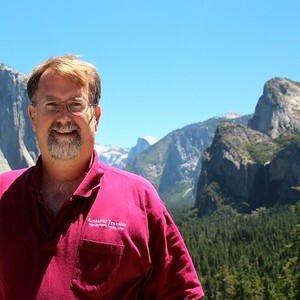 He had previously worked at a number of national parks before joining the crew including stints at: Everglades National Park, Olympic National Park, Point Reyes National Seashore, Grand Canyon National Park, Denali National Park, Hawaiian Volcanoes National Park, Mount Rainier National Park, and Glacier Bay National Park. Which is to say, he knew his stuff. Our first wildlife encounter came before we even left the shelter of the breakwater. One of the best spots to sea California Sea Lions is at the end of the breakwater by the Coast Guard Pier. 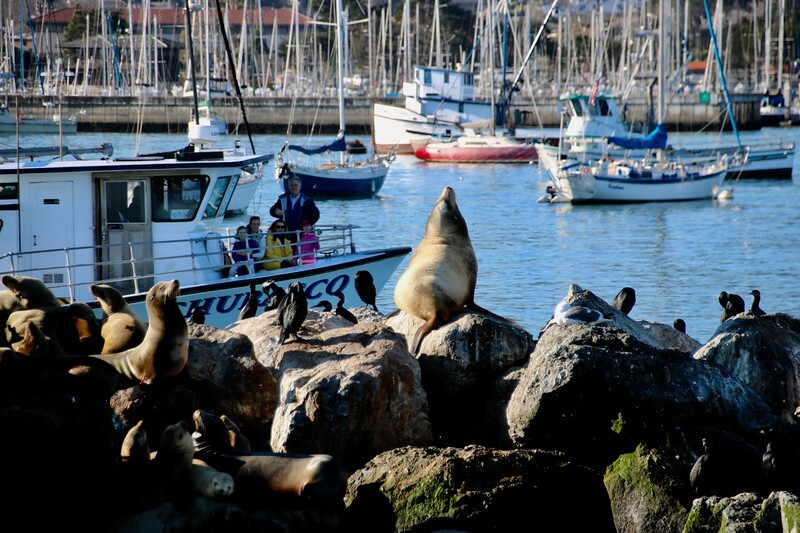 These sea lions breed in the Channel Islands off of Santa Barbara but spend much of the rest of the time as tourists in Monterey. We also caught sight of a couple of sea otters cuddling in the kelp. 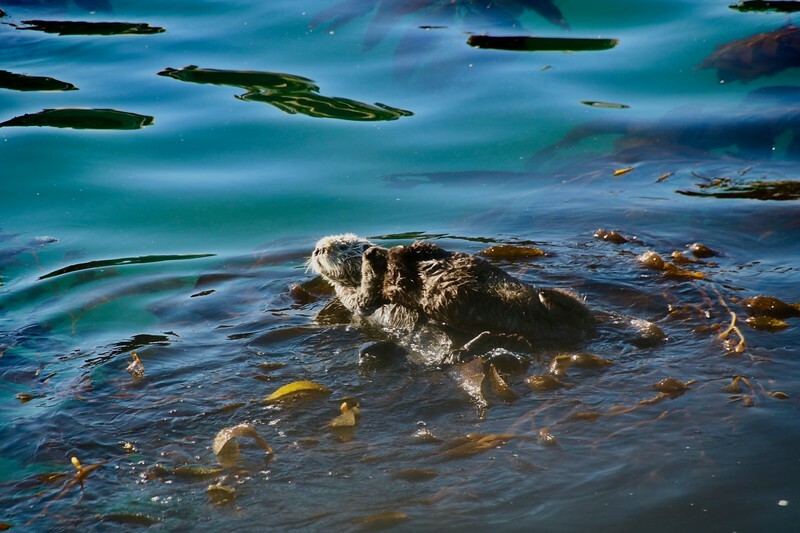 As we sailed back in later we saw a raft of around 15 otters hanging out by the hotels of Cannery Row. 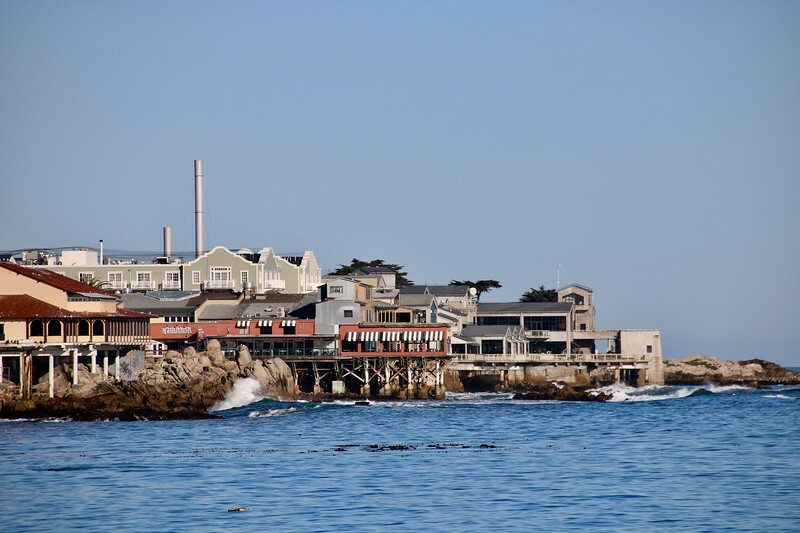 Even if you don’t spot a single whale the first part of the sail out, especially at our 9:00 am start is beautiful as you sail along the coast by Cannery Row and the Aquarium, past Lover’s Point and Pacific Grove Lighthouse (the oldest lighthouse on the west coast). See all my photos from my whale watching trip. While we sailed out Greg talked to us about the different types of whales we might see like grey whales, humpback whales or possibly even Orcas (Killer Whales). There are two types of Orcas. The resident Orcas eat fish while the transient Orcas hunt other sea going mammals including baby whales. 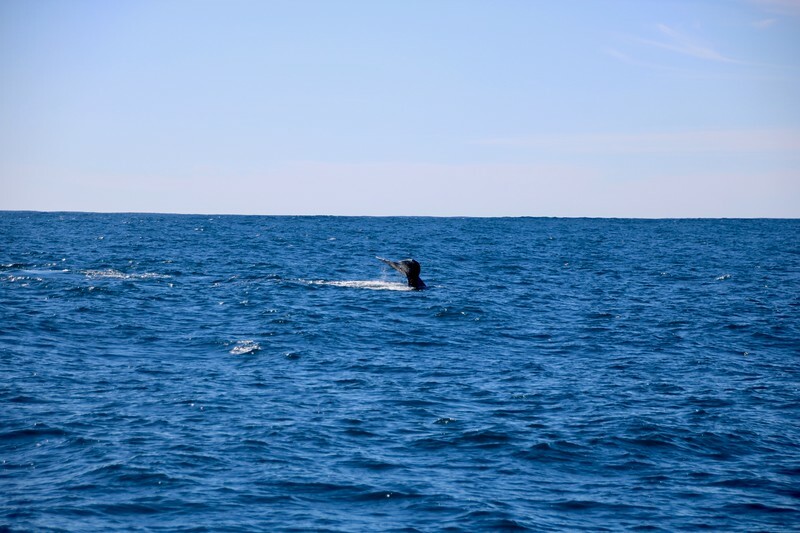 For this reason the best time of year for whale watching is April and May when the mother gray whales are returning from places like Magdalena Bay in Baja California where they give birth (read more at Small Ship Cruise on UnCruise In the Sea of Cortez – Baja Sur, Mexico). During this time of year you are much more likely to see pods of Orcas hunting these migrating whales. While we cruise out let’s talk a little history. When Mexican Jesuit Priest Miguel Venegas published the book “The Natural and Civil History of California” in 1758, he wrote that the explorer Vizcaino encountered “huge sea wolves [or sea lions] and whales” in what is now Monterey Bay. Not far from the Customs House Museum and Fisherman’s Wharf in Monterey you can still visit the Old Whaling Station adobe (a California state park) that was the headquarters of shore whaling in Monterey that started in 1855 and continued until the 1880s when whales were becoming too scarce to sustain the operation. When you get on a boat these days to head out whale watching you are entering the vast Monterey Bay National Marine Sanctuary which extends all the way from Marin north of San Francisco to Cambria in the south. In all, the sanctuary stretches 276 miles along the coast and extends over 6,094 square miles. In the center of this sanctuary at Monterey Bay is a giant canyon that reaches out into the ocean. 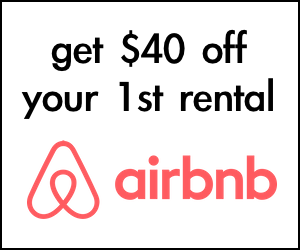 It starts at Moss Landing and is deeper than the Grand Canyon. The deepest part of the marine sanctuary is over 2 miles deep. Geologists speculate that California’s Central Valley may have at one time emptied into Monterey Bay. Where we were heading was to the lip of this canyon off Carmel where the surface waters mix with these colder waters rich with food that attracts sea life. The whales we were tracking were swimming from Mexico up the coast of California towards Alaska, so you can’t just go back to the same spot you saw whales yesterday. Our captain was on the radio and on his cell phone with other boat captains and we all kept a sharp eye out once we got out of the bay. Using the ship as a clock the crew would announce “whale at 9 o’clock” (on your left) or “whale at 1 o’clock” (to the front and a bit to the right) when they saw the mist of whale spouts as the animals came to the surface to breathe. 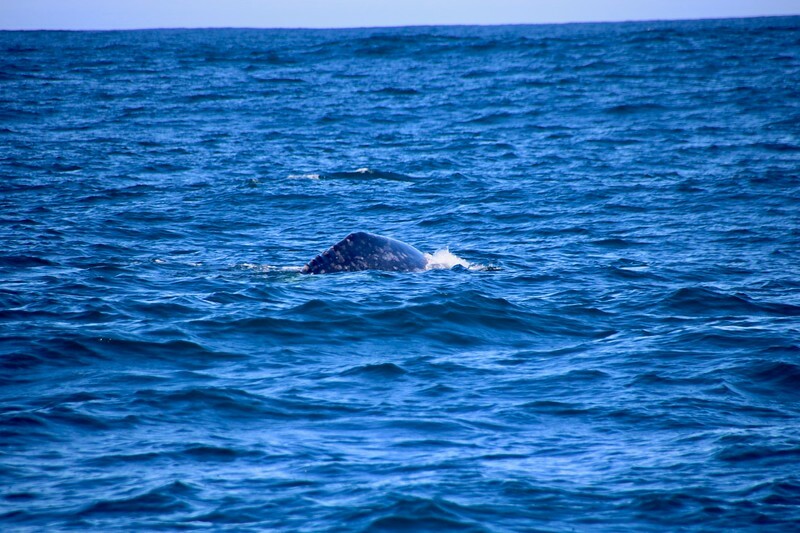 Most of the whales we saw were the mottled gray color of the gray whales. 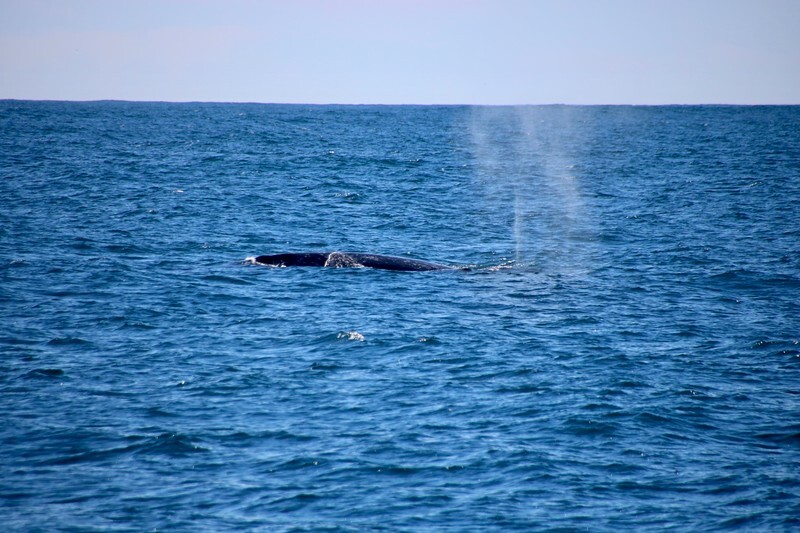 Adult whales are about 50 feet long (15 meters), but most of the time you will see the spout and the back of the whale. While occasionally a whale will spy hop where they poke their head above the water or breach where they jump out of the water, we did not see either behavior on our trip. On more than one occasion we did see the whale’s tail as it got ready to dive back down underwater. I liked to think it was waving goodbye to us. In addition to sea mammals we saw a number of seabirds including the black-footed albatross. These birds are born in the Hawaiian Islands but will spend about 5 years at sea before they return to the islands to mate for the first time. 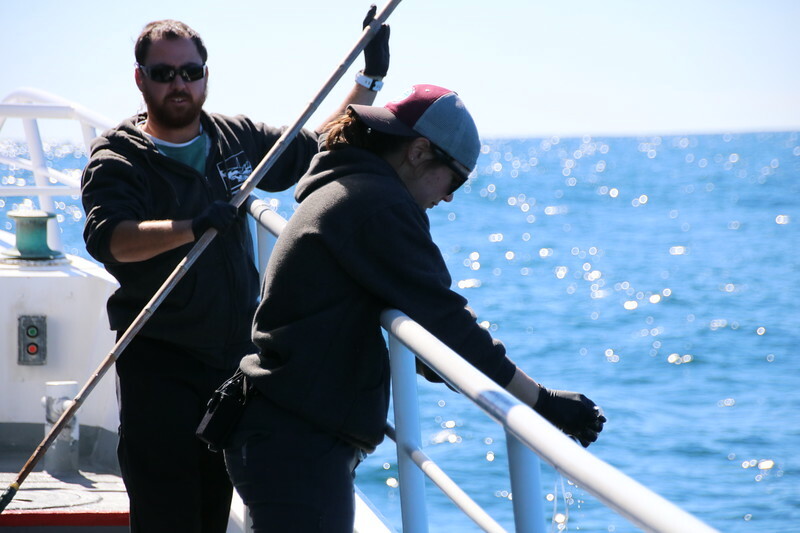 One caution about whale watching out of Monterey is sea sickness. I am not someone who is prone to seasickness, but did indeed succumb on this trip. It would have been wise for me to take sea sickness medicine before the trip but I had not expected to need it. After all, I have sailed around Cape Horn before with no problems, although admittedly on a larger boat. It looked like a very calm day inside the harbor, but as you make your way out of the bay there are some powerful currents that made the ride less than smooth. Those riding on the bow occasionally got wet. Before we boarded we were told that if we felt queasy we should stay out in the fresh air and move to the stern of the boat which does not have as much motion. Whatever you do don’t hang out in the head (toilet) because the stuffy air will not help. If you do feel sick “abandon your pride, go over the side”. 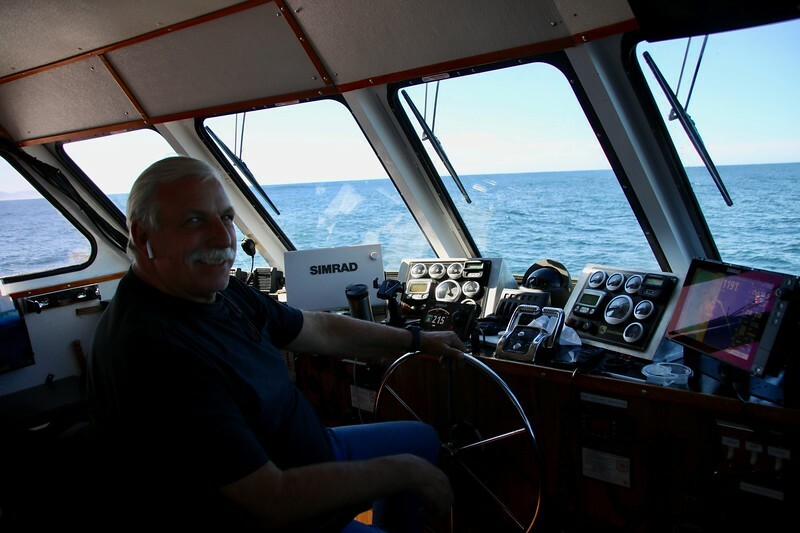 Our captain was Captain Scott who has been captaining boats out of Monterey for 30 years. He invited me to come chat with him in his cabin which was part of my seasickness problem as the cabin was warm and stuffy and I eventually needed to excuse myself before I redecorated it in an unpleasant way. The deck hands Josh and Katelyn were wonderfully patient with those of us who created work for them by getting sick and not necessarily making it all the way over the side. They quickly got people a glass of water and a paper towel to clean up and had pockets of ginger candy to help prevent sea sickness. Also on the crew, Daniel is a photographer and they showed a slideshow of his work as we sailed back in. 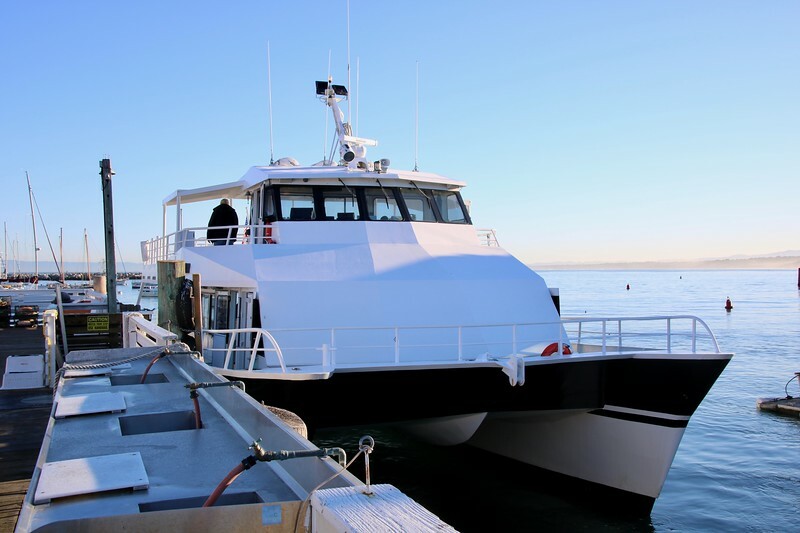 The whale watching out of Monterey is a beautiful way to spend an afternoon on a beautiful day in March. Take some bonine, dramamine or your sea sickness prophylactic of choice just to be on the safe side. Bring your binoculars or a camera with a good zoom as the whales and sea life will be pretty small in your cell phone photos. Bring layers because it was cooler out of the bay than inside it but also warmed up in the sunshine a beautiful later winter day. Thanks to Monterey County Convention & Visitors Bureau for arranging my trip and to Monterey Bay Whale Watch for sponsoring it. Also thanks to Monterey Bay Whale Watch for the muffin I had for breakfast… even if I didn’t keep it as long as I would have liked.